A few months ago, I had a life-changing facial (one that Jennifer Lawrence adores as well), and I've been dreaming about it ever since. The results were immediate and long-lasting—I barely wore foundation for the rest of the month. Since that fateful afternoon, I've been trying to figure out to re-create the results without seriously disrupting my cash flow (while incredible, the facial is tagged at a cool $800). Distraught, I sent an email to the experts at New York Dermatology Group for advice. The answer I received made me want to break out into song. Dr. Colbert, the brains behind the Triad Facial I so deeply loved, also has a product line, and it's meant to be used post-facial. Each ingredient is incorporated into the powerful, potent blends to keep your face toned,wrinkle-free, and even-looking long after you leave his office. My favorite? 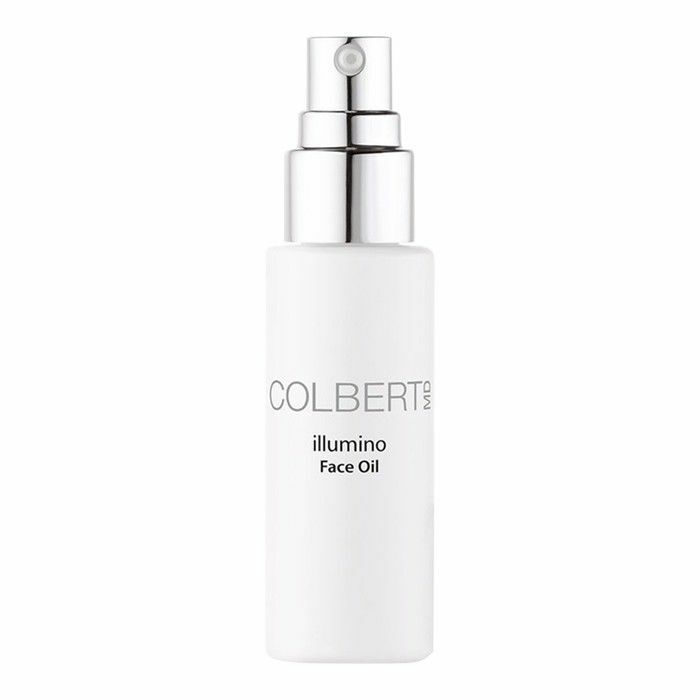 Colbert MD's Illumino Face Oil ($150). Made with retinol and vitamin C compounds to soothe and comfort your complexion, the oil is absolutely luxurious. It feels velvety as you apply to damp skin and doesn't disappear for hours. I like to use it with my Stacked Skincare Collagen Boosting Micro-Roller ($30) for that reason. It's really slippery and soft, so it works well to nourish your skin with every prick of the micro-roller. Along with the retinol and vitamin C, the oil is packed with borage seed oil to aid in cell repair (as well as improve your skin's overall tone and texture), yangu oil for elasticity and suppleness, marula oil for hydration, passion fruit oil for extra antioxidants, and argan oil for vitamin E.
Essentially, this is your one-stop shop for good skin. If you find your skin looking tired, sallow, or generally lackluster, this is the product to immediately pep it up. A little goes a long way, so it lasts long enough to reconcile with the price. Looking for more incredible skincare options? These anti-aging products give instant results.